Artist's concept of the exoplanet Kepler-186f, which orbits in the habitable zone of a red dwarf star. Planets orbiting small, dim red-dwarf stars might be good places for alien life to spring up after all. For years, many astronomers thought planets around such stars, also called M dwarfs, were probably uninhabitable. Any worlds close enough to be in these relatively cool stars' "habitable zone" — the range of distances where liquid water can exist — were likely to be tidally locked, the thinking went, with one face freezing and the other at a boil. Red dwarfs also have a tendency to flare dramatically, doubling their brightness — and perhaps frying any nearby life forms. "There are a lot of advantages for looking for small planets around red dwarf stars," said John A. Johnson, an astronomy professor at Harvard University. For one thing, red dwarfs are incredibly numerous, making up about 70 percent of the Milky Way's stellar population. Further, these stars are quite stable. Their superflaring period generally lasts for just 1 billion years or so, after which they settle down significantly. And red dwarfs' low masses mean they burn through their nuclear fuel slowly — so slowly that the universe isn't old enough for any of them to have died yet. 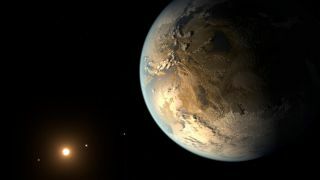 Their habitable-zone planets might not be tidally locked, either, as recent work has shown that an ocean or thick atmosphere can help keep a planet rotating. Johnson plans to use the data from the ongoing K2 mission of NASA's Kepler space telescope and Transiting Exoplanet Survey Satellite, which is due to launch in 2017, to find such planets. He's already gone through the data from Kepler's first mission run and found candidates for Earth-size planets close enough to a red dwarf to have liquid water, such as Kepler-186f. It also can be easier to spot planets around red dwarfs than around larger, brighter stars. That's because one method for detecting exoplanets is a "radial velocity" measurement. As a star moves toward or away from Earth, its spectral lines are shifted toward either blue or red — a phenomenon known as Doppler shifting. The gravitational tugs of orbiting planets can leave their marks on this spectrum, allowing astronomers to infer these planets' existence. This method doesn't work as well with larger stars, such as the sun, which aren't pulled as dramatically by their planets. A red dwarf star, on the other hand, would have habitable-zone planets much closer in, and the center of mass would likely be outside the star, making planets easier to find, researchers say. Another planet-hunting method, the transit technique, also works well with red dwarfs. This strategy, employed by the Kepler spacecraft, looks for dips in a star's brightness as a planet crosses its face. In general, the larger and brighter the star, the smaller and less detectable these dips will be. Johnson's team isn't the only one looking for planets around nearby stars. Pennsylvania State University researchers are leading the development of the Habitable Zone Planet Finder (HPF), a spectrograph installed on the 30.2-foot (9.2 meters) Hobby-Eberly Telescope at McDonald Observatory in southwestern Texas. The spectrograph operates in infrared light, where dwarf stars shine more brightly. William Cochran, an astronomy professor at the University of Texas at Austin, is one of the scientists who will be working with the HPF when it is completed in 2016. The HPF will target M dwarfs specifically. Most of the stars that Kepler has looked at were larger and brighter than M dwarfs, he noted. The planets will have small orbits and relatively short periods — on the order of days or weeks. "M stars are a good place to look," he said. "M stars are the most abundant stars in our galaxy. The nearest habitable world will, statistically, be found around one."